Not much to see here I did make a spray stick though - a small piece of wood I had in the garage for years, some double sided tape and the Aberrants, heavy weapons hybrids and a few other first and second hybrids. So much easier to spray, although next time I'll ensure I don't put one so close to the end as being able to hold it from both sides helps with the spraying. Since this I've managed to build all my other Hybrids and the Deathwatch team members. All I need to do is base them ready for undercoating and I can have them all ready and waiting - put them in a box until I have chance to paint them that is! 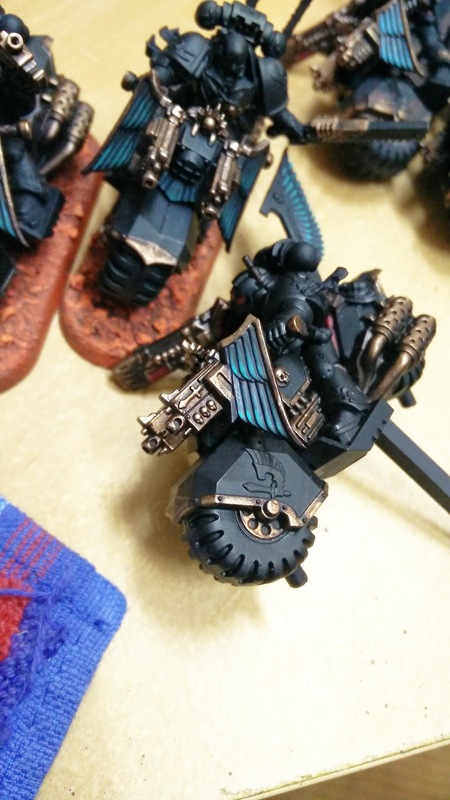 Painting the feathers on the Ravenwing should not be my priority. I seem to be saying that a lot actually. 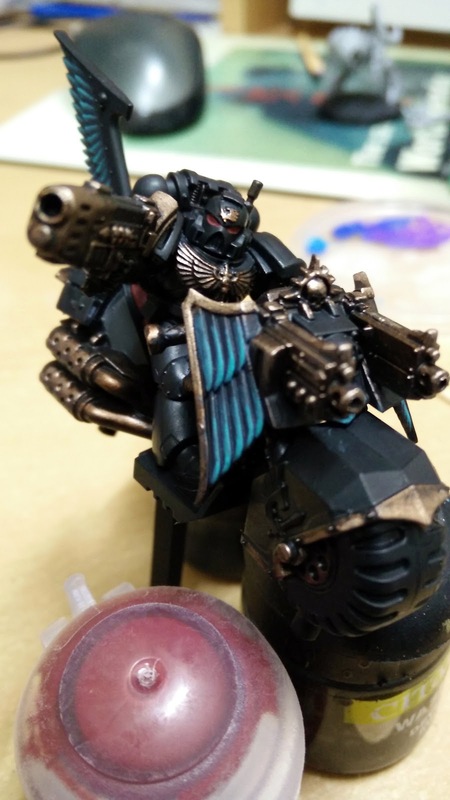 The bikes themselves are but the wings should really be done after I've finished the metals and the black because I'm clearly going to screw it up in places. However I'm having a lot of fun with it so I just carried on. I also moved on with the resin base for the Nephilim/Dark Talon, washing the Red Oxide Primer with Army Painter Strong Tone. 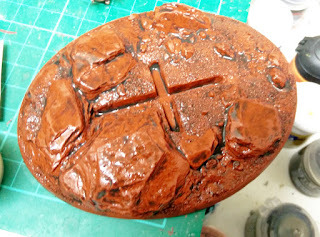 Then it was Vermilion craft acrylic for the highlight. Followed by my first pass Vermilion and Pumpkin highlight mix, just about evident from these pics. 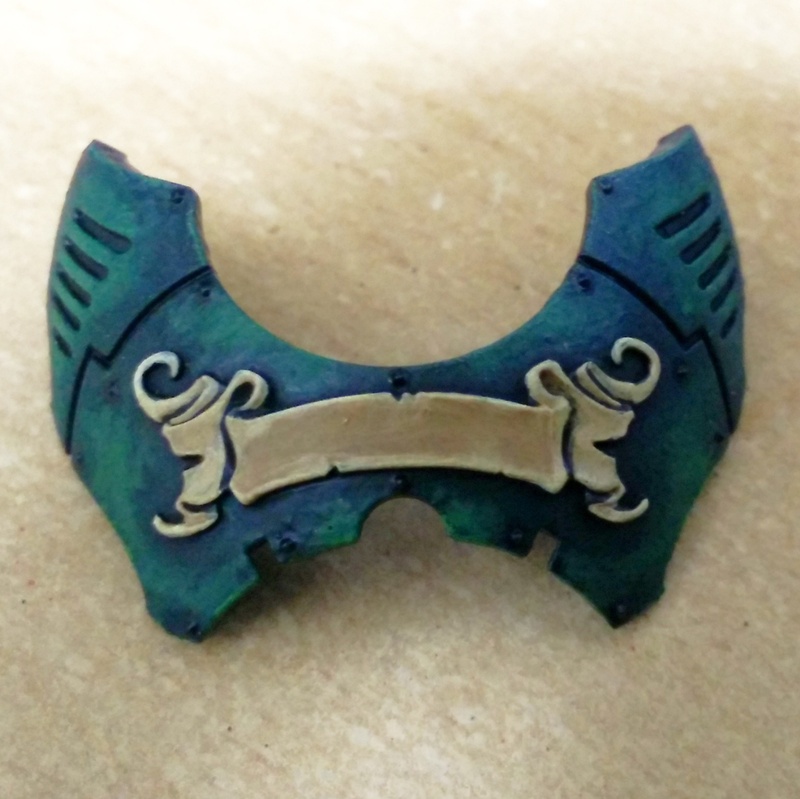 2nd pass highlight and then pure pumpkin edge highlight and bonewhite chips to do and then I can varnish this. This happens regularly and I usually find a work around but this time nothing works. 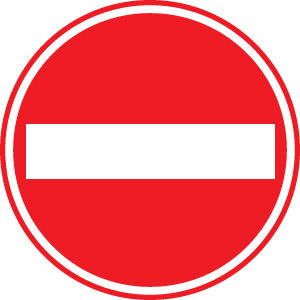 It seems the 'powers that be' have manged to deny access to any sites that are related to 'games'. So I will not be able to keep up-to-date on some of the things I normally would. I can currently still make blog posts but I can't review them afterwards or cross reference older posts or other blogs as I would normally like. Its really very frustrating but there's not much I can do at this point and I'll try to continue on within the confines of these limitations, thanks for your patience. 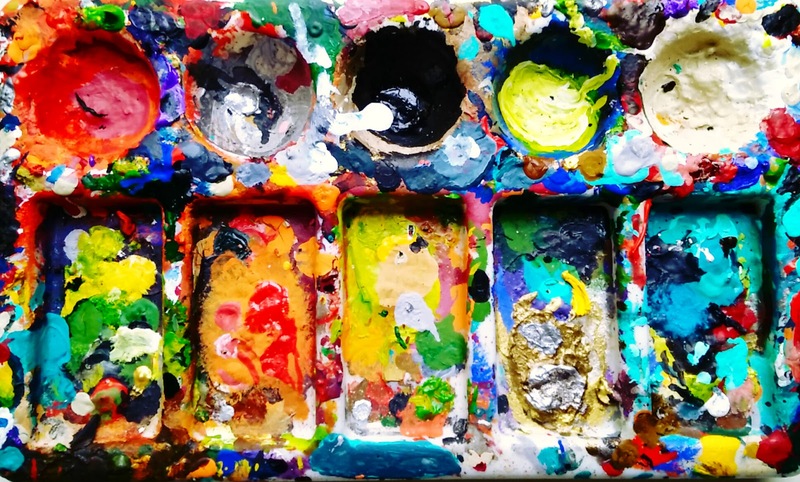 Its a bit difficult at the moment to actually collate what I'm up to as I'm doing three or four things in any one painting session. 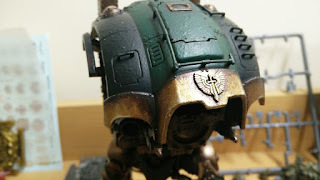 So it's difficult to show progress and we're already at part 12 of this Knight. Anyway, I moved on with the chest plate for Euronymous. 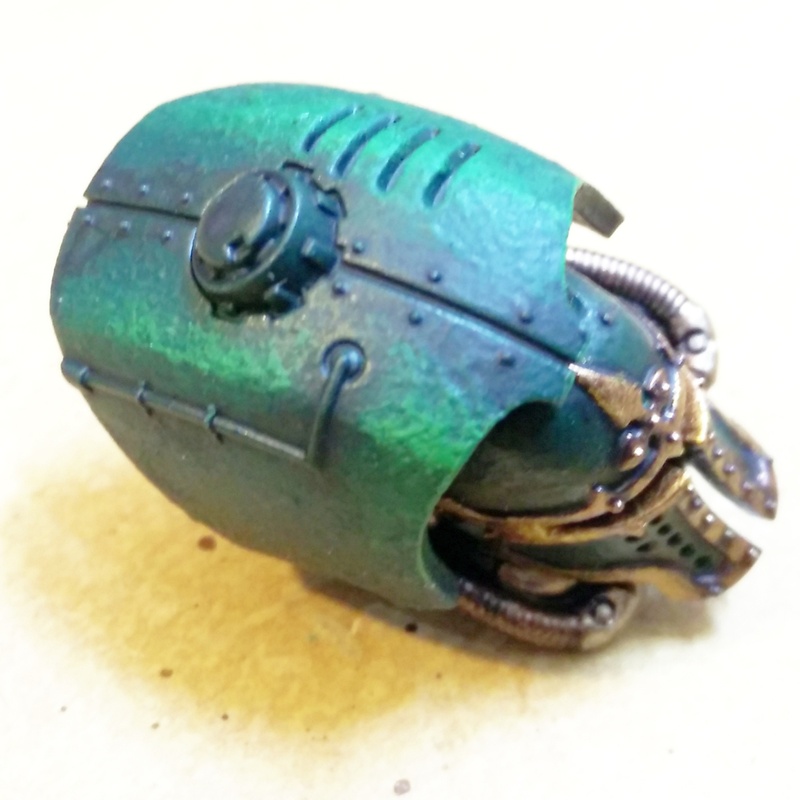 All the green has been done, I could probably use this piece as a test bed for the battle damage too. 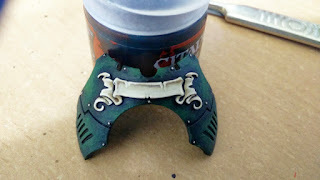 The scrollwork has been base coated and washed. I then went in with some more highlights on the scroll and picked out the rivets in bonewhite, which matches my greenwing. 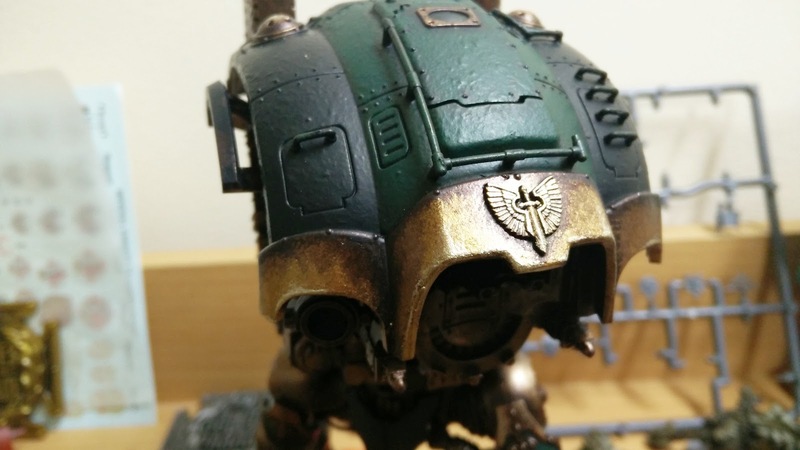 In another session I added some extra highlights on the bronze on the carapace, I also did the shoulder panels too but need to do the rest of the metallics and also on the Ravenwing. 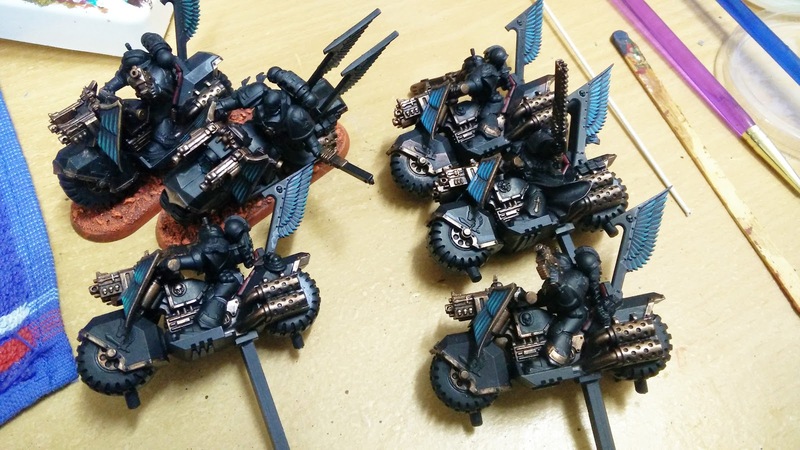 If I can get all these metal highlights done that will be a massive step forward. 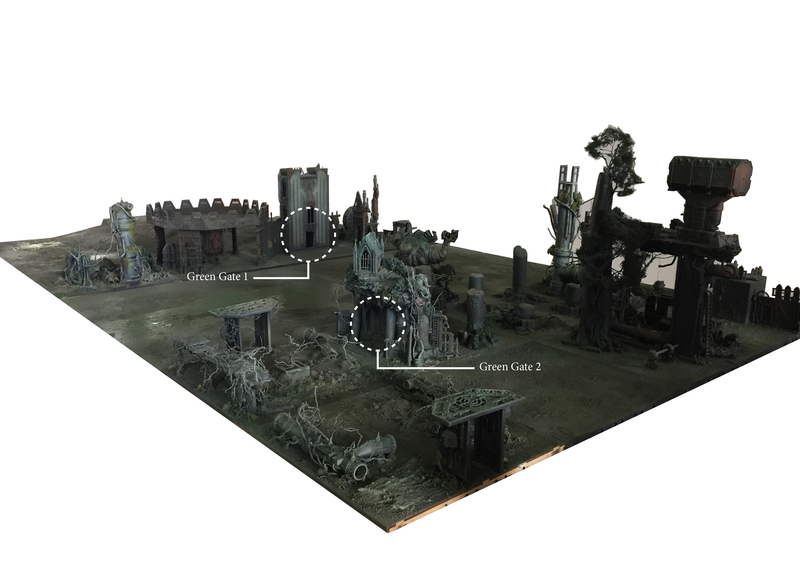 Having completed some of the panels it would join up with those elements still to highlight and the end would almost be in sight, it;s very exciting. I also spent a session blocking in the chevrons on the Gatling Cannon and fist, I may well wish I'd gone orange and black at some point but these will ultimately be yellow and black, with the frotn of the cannon being all black which I'll decorate with decals. 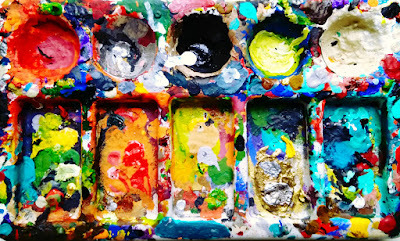 Again, this shouldn't be my focus as it can't feature in my Double Trouble list but I'm just going with the flow and with it not being the sole thing I'm painting in any given session I don;t feel too guilty about it's inclusion in my schedule. Despite the arm pain I actually managed to do some bits. In fact because I took the day off to see the doctor I had some free time and in a moment of madness I just decided to knock out a couple more Vortex templates. Having enjoyed the fun of them in my last game I'm hoping for a number of doubles in future games and I though three would be sufficent. I originally completed the first one in July last year and had put aside a couple of the Christmas baubles the other day. Bless me readers for I have sinned, it's been just over a month since my last confession and I just need to evaluate where I'm at to keep track and focus. 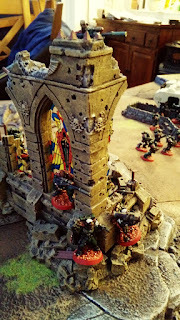 When last we spoke I was struggling to motivate myself after Throne of Skulls, this time I'm struggling because I completed the Tactical Squad, they were actually bottom of my list of things to do, although it wasn't a priority list. This time I've listed what I think should be my priority. That's not to say I have to stick to it but if I have any sense this is the order of play. The Ravenwing are lacking in my Dark Angels, by all accounts they’re the most effective elements of the Codex, not so much the flyer, but the bikes have been pretty good and they’re not even the Ravenwing Knights! 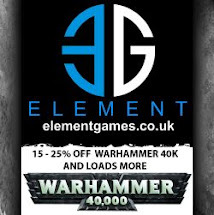 Both these items would be perfect to slot into my 750pt list for Double Trouble should I get the OK to go from the wife [if she’s not working]. 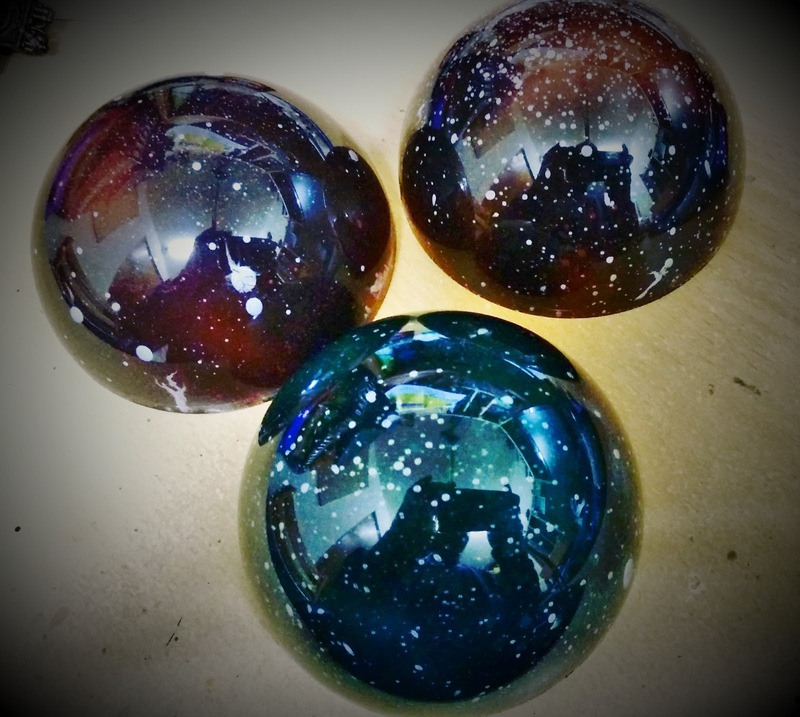 What was troubling me was I still couldn’t get a flat black in places and have bought a number of blacks to try and achieve it. It’s still not what I was after but I’m hoping I can find a way to mitigate my dissatisfaction with other effects that will obscure what I’m unsatisfied with. I also picked up some Citadel Rhinox Hide, which GW suggest thinned with Lahmian Medium in the crevices of black add some much needed depth [?] and some Dark Reaper too. 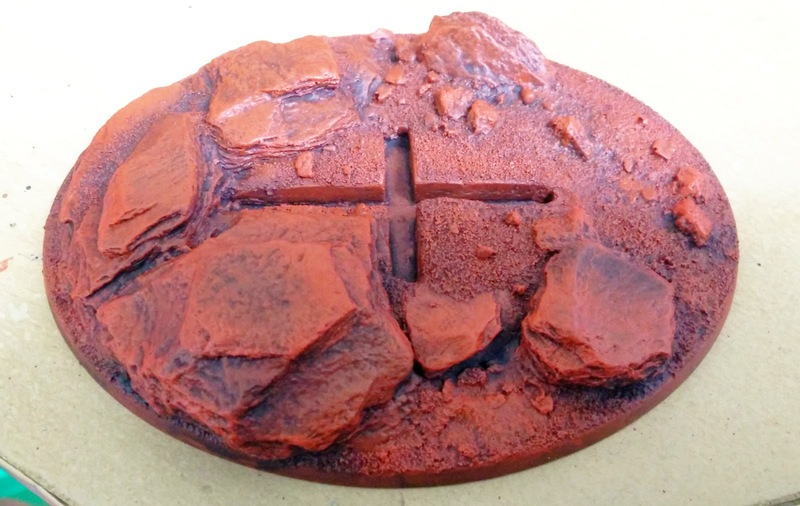 Dark Reaper is their standard black highlight, but surprisingly is mail order only. Equally surprising was the colour when I got the order. 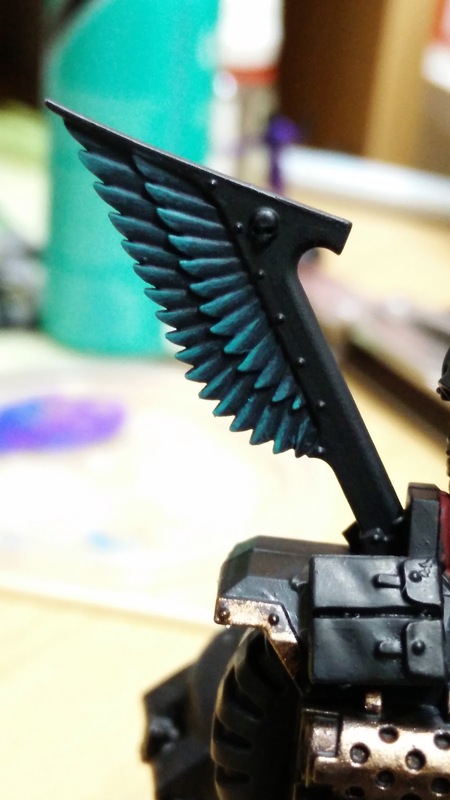 My own turquoise/black first stage highlight is darker so I’ve not conveniently got a 2 stage highlight, which might streamline the Ravenwing process, we’ll just have to see. As you'll have seen my motivation has taken a little knock but luckily I managed to find something to progress on after a couple of days. The Knight may be down on my list but the most important thing is to re-ignite the mojo. 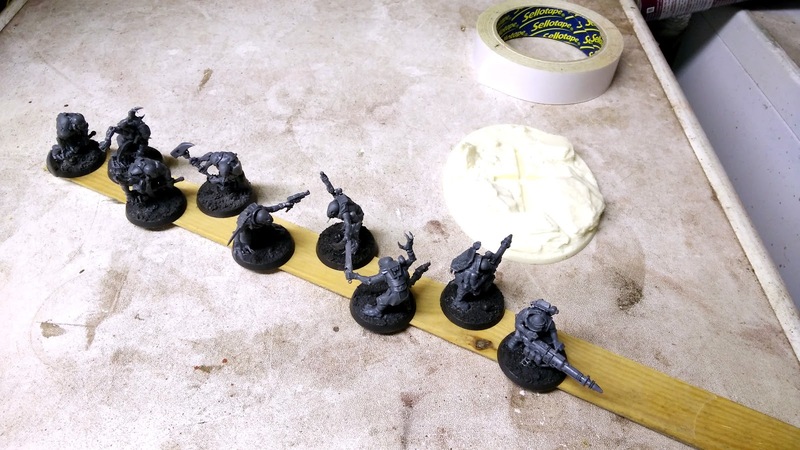 In fact I even forced myself to do a set of Bonewhite highlights on the Genestealers to get me going. 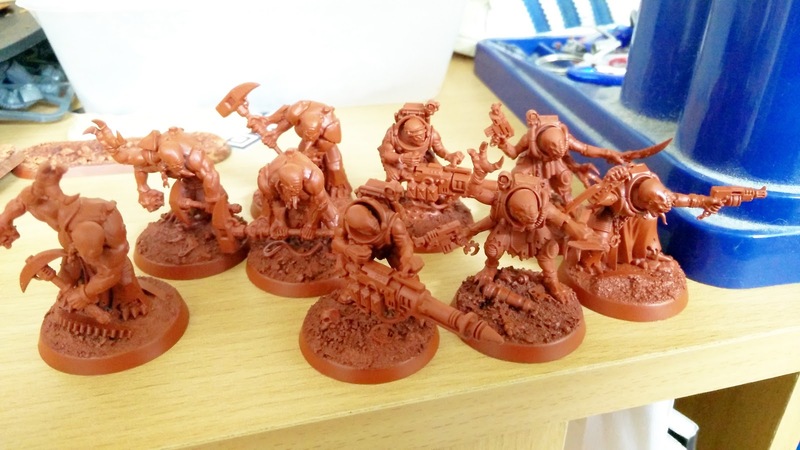 Now the interesting thing is I've done the Bonewhite on the head, chest and back on all the current form of Genestealers, that's the six with Toxin Sacs on and five with chitin plates but exposed backs. There are ten with Chitin coloured backs that won't need doing and the original Space Hulk Stealers will be relatively easy with their mainly fleshy backs. Multiplied by 6 gives me 18 days per highlight. But it looks like the head, chest and back will only take two days, shaving another four off my schedule for one highlight and a further four when I do the next level highlight! Maybe some of the other elements will follow suit but more importantly this process is really breaking down the build up of frustration these usually bring. Of course I'm not onto the arms, which are the really killers but I'm quietly confident I can get these guys done and hopefully well ahead of schedule, even fitting them around priority projects. And I have to admit that although I detest time keeping I am finding this highly useful in both predicting my workload [made more fun by how I'm overachieving on it]. It's definitely something worth noting, although the subject matter is very easy to break down into it's constituent parts. Can't see the Broodkin being as straightforward to section. Anyway, I'm not dead [which can be more than is said about all these celebs at the moment], just hanging in there. Having completed the Tactical Marines I'm struggling to be motivated, that translates to two nights without painting and STILL staying up post midnight - what's THAT about! Luckily the muse evetually finds me and although the Knight should be way down my list I'm compelled, which is good enough. The Ion Shield was at this stage prior to my lack of motivation but it's much better than I expected. 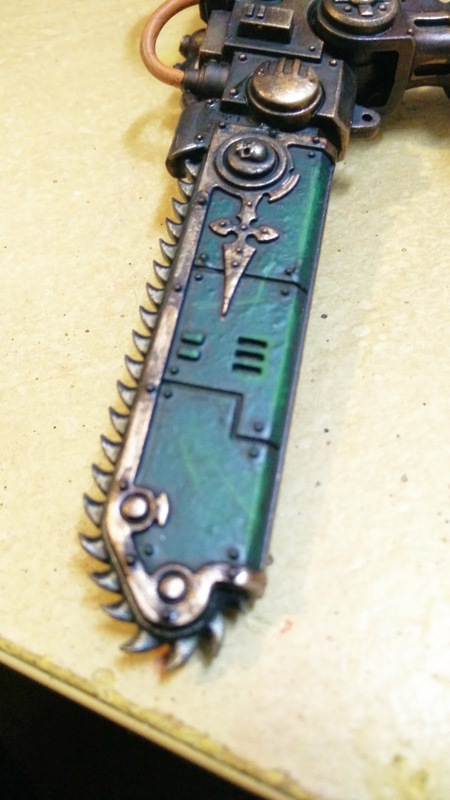 I'd also done the chainsword, all the greens highlighted at least. 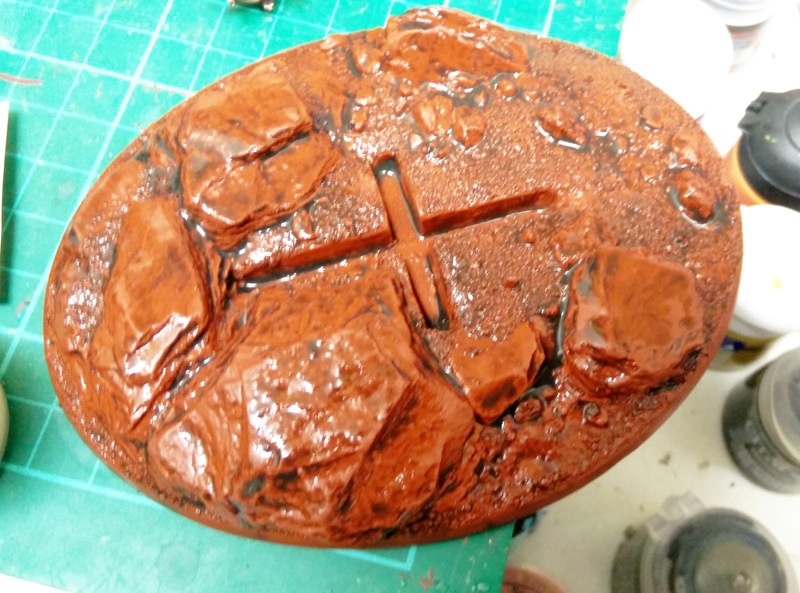 I did however add the black stripes for the Gerantius connection on the carapace. 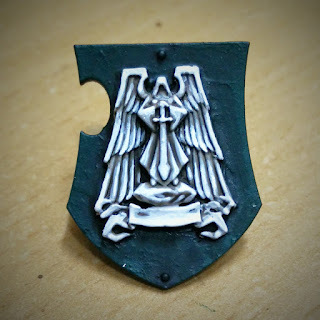 It may be too soon but I felt I needed to be laying paint down even if it requires a touch up down the line. 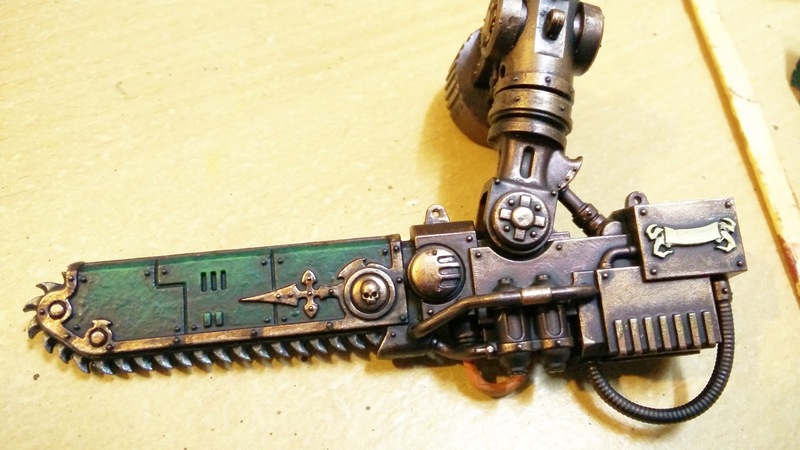 Another shot of the chainsword, I think the highlights are a bit brighter than my Tactical Squad but I'm OK on that, the texture paint makes it less lake some Tron cos-play outfit. 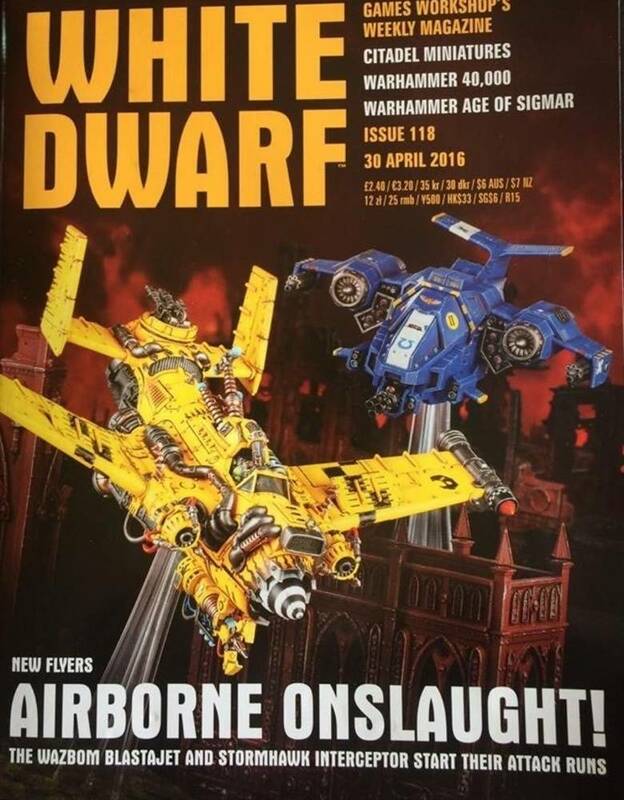 But with Renegade in the offing I want him done, even if his priority is well below the needs of the Dark Talon and Ravenwing bikes. Something else I noticed is I've done all of my alternate weapons with green armour plates. 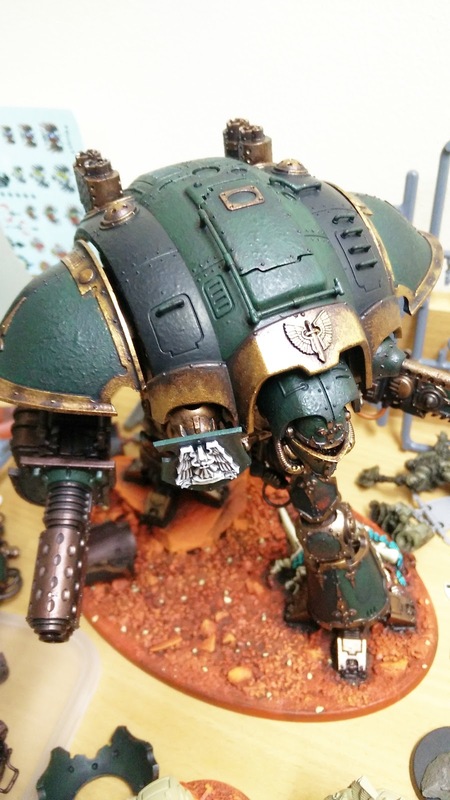 Which is fine, it's just should I ever get another Knight so I can expand my House Raven household then the green paenls will clash. So I'm debating whether to go ahead with the green, replace it with black - which will fit both households or go Chevrons, which will still work but lean towards Raven. It's only the Gatling Cannon, Carapace Weapons and Thunderstike fist that are an issue, I just need to weigh up aesthetics versus versatility. After pushing on through I finally finished my Dark Vengeance Tactical Squad. I didn't take too many pictures as I was pressed for time and although one of the first GW rules of taking miniature pictures is not to use natural light [a lighting setup is much more controlled] I do just that because so far it's delivered the best results, granted there have been some predicted disappointments. But surprisingly these aren't as bad as I'd feared. I'm still not sure the amount of effort I put in them is evident, the green in particular is so subtle it could perhaps have been achieved with the base coat and a wash! But the figures turned out OK and the Sergeant too was rescued, his eyes have been done and although I re-did the skintone and made some mistakes I actually think I've done a better job of it. I even resisted the urge to highlight his eyebrows so they would look like skin - who has shaved eyebrows? So I actually painted some on, they're practically un-noticeable but I think that's because it looks more natural. 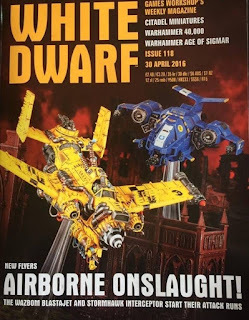 I'll do another photo-shoot down the line with the AoBR boys so you can compare the originals and more recent models for consistency but so far it looks pretty good. 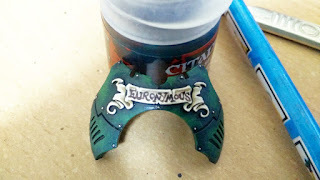 I probably need to do some more close ups of the litanies inscribed on the armour. It can be quite a challenge to think of new ways to do it and the Plasma Gun guy was supposed to have two crossed swords on his left leg that went so pear-shaped I covered it up with a box which I then filled with green 'text' so it was more like a painted plaque on his leg. The Sarge has a similar sort of illuminated script on his left leg with some added detailed border work. As you may have seen, freshly painted they entered into battle and did shockingly bad but that can;t diminsh I now have 20 Tactical marines painted, it sounds insignificant but to me that's extreme. I never completed 20 ever! And to add the Devastators in too... well I'm looking forward to exhibiting a new army at Armies on Parade this year. Big green stamp of approval to me! 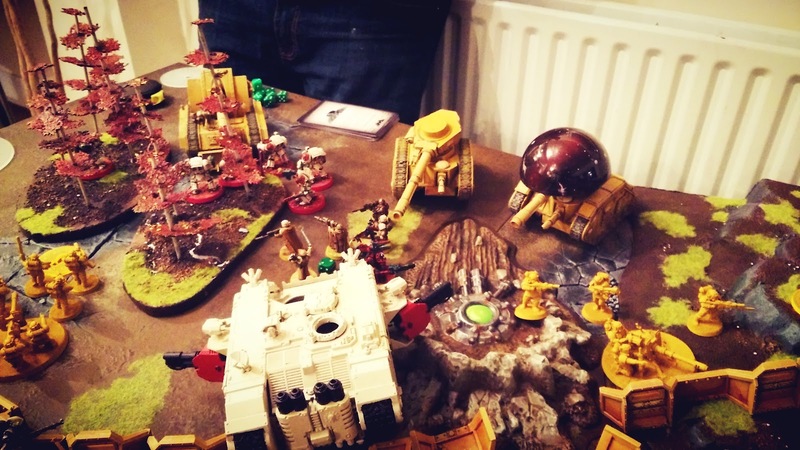 1500pts battle report - Dark Angels v Imperial Guard and their Skitarii mates. No night fighting first turn, won deployment, went first, Ben failed to steal the initiative. Compared to Ben's army this didn't feel like very much and as he's got Leman Russ's, Basilisk's, Wyverns and Heavy Weapons Teams my army was pretty much outgunned. Oh yeah, he also had a Quad gun, even though he didn't know I had decided to take my unfinished Dark Talon! I was more conservative than usual with my positioning of the scouts. But they did look cool in the ruins. 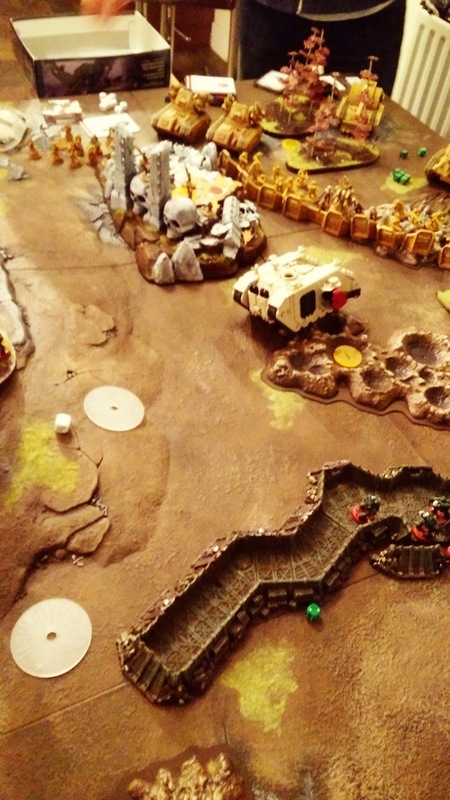 First, turn and with Land Raider potentially falling in Ben's turn I went flat out through the craters, passing the dangerous terrain test. 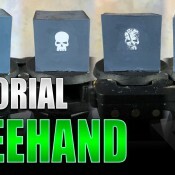 Unfortunately I couldn't do anything to the Quad gun so I concentrated on the Hellhound. The Devastators managed to get 2 hull points off it. 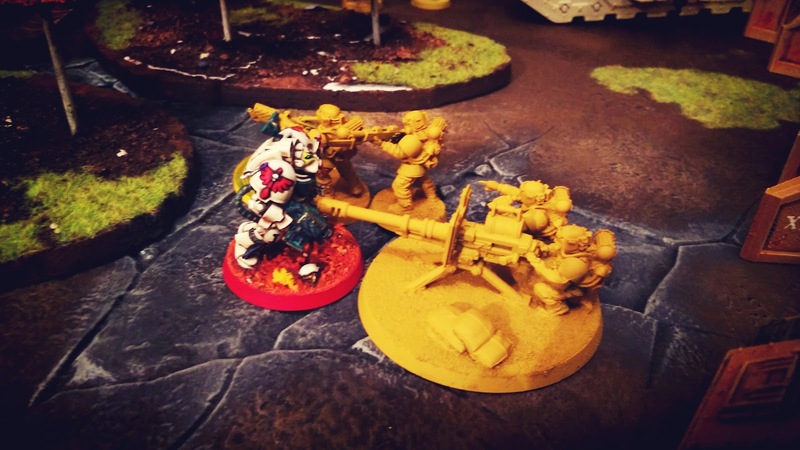 The Tactical Squad Missile Launcher failed to glance and the Plasma Cannon missed. 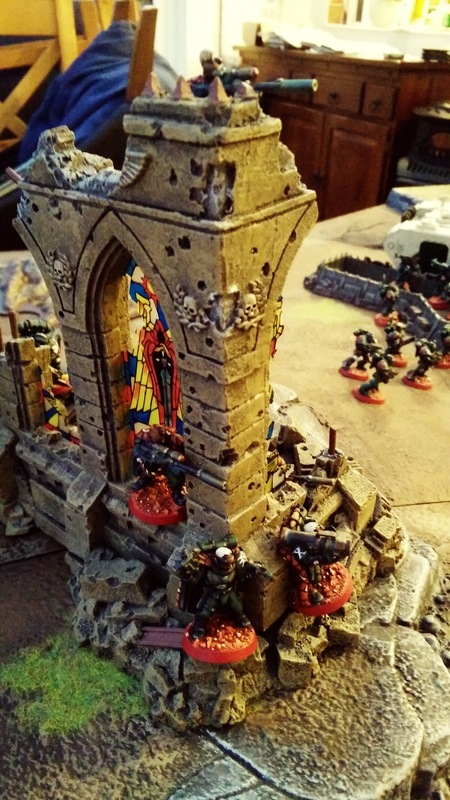 The bastion did pick off a Guardsman, and the Scouts took a few. 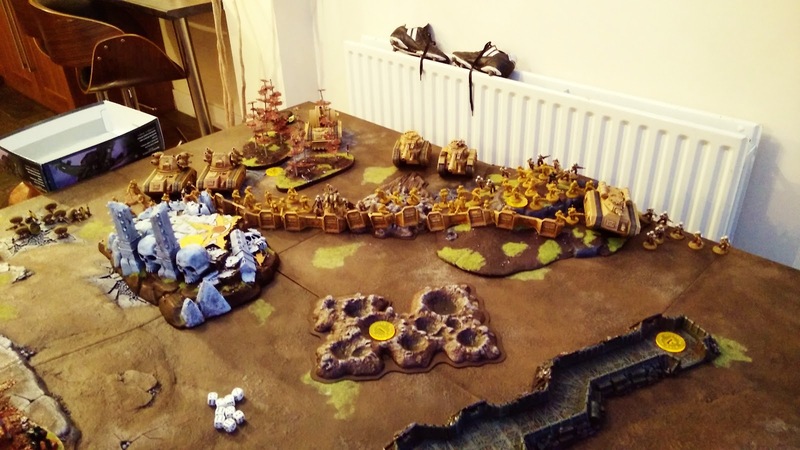 My cards were pretty ropey, kill Ben's Psyker, kill 1 or 3-5 or 6 units and I think to hold all the objectives, which I discarded. 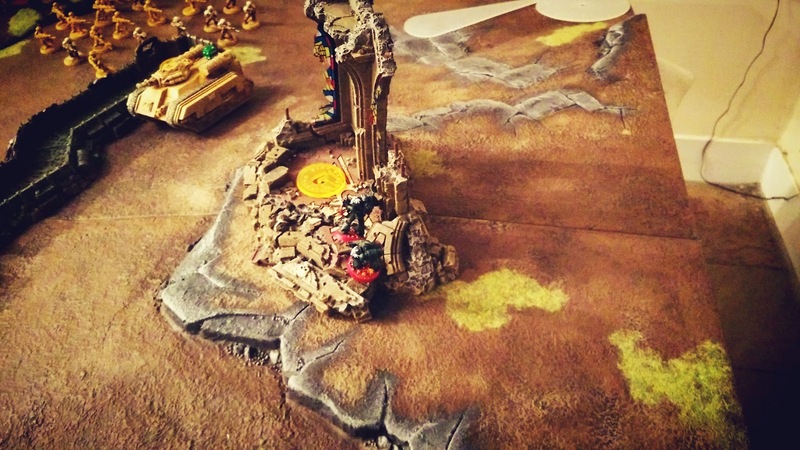 The Hellhound got to kill the Scouts, it's Flamer killing all but the one on top of the ruins, who was picked off by it's hull mounted Heavy Bolter - First Blood. 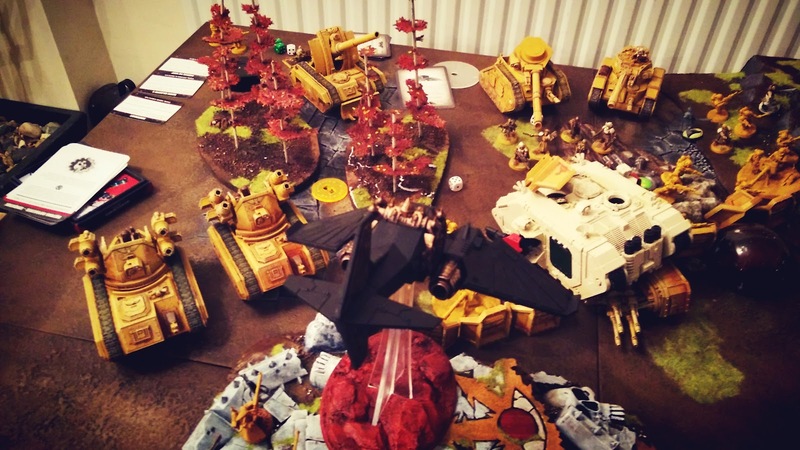 Ben's Wyverns removed the Devastators :( Tactical squad in the woods get reduced to 2, fail their morals check and run off the board! 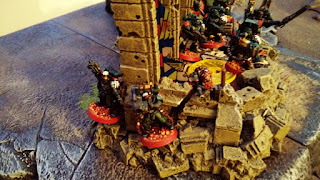 Tactical squad in the Ruins have their Plasma Cannon marine shot off the board too. 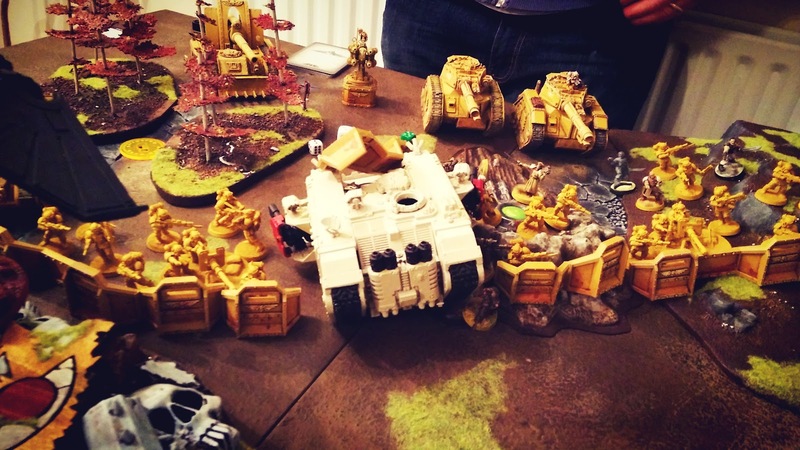 The Leman Russ Targeted the Land Raider and it managed to survive with 2 Hull Points damage and a wrecked Assault Cannon. 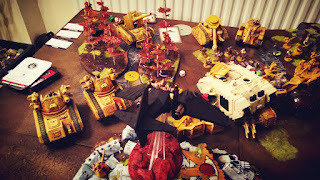 I feverishly consulted the rulebook... My turn 2 and the Dark Talon arrived [after Warlord Trait re-roll], the Deathwing also arrived [again after Warlord re-roll] but then mishapped after teleporting onto Ben's psyker, who I'd laughingly suggested was a Fallen. Turns out they were very interested in him and managed to return to the orbiting strike cruiser to come back again next turn. With the Dark Talon at risk from the Quad Gun I had only one option TANK SHOCK! 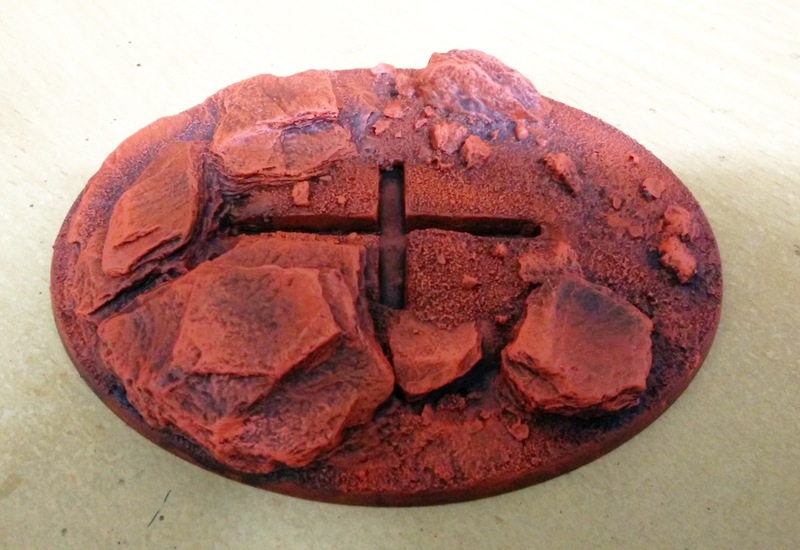 I passed my dangerous terrain test to get off the craters, passed the next one to crash through the Aegis. 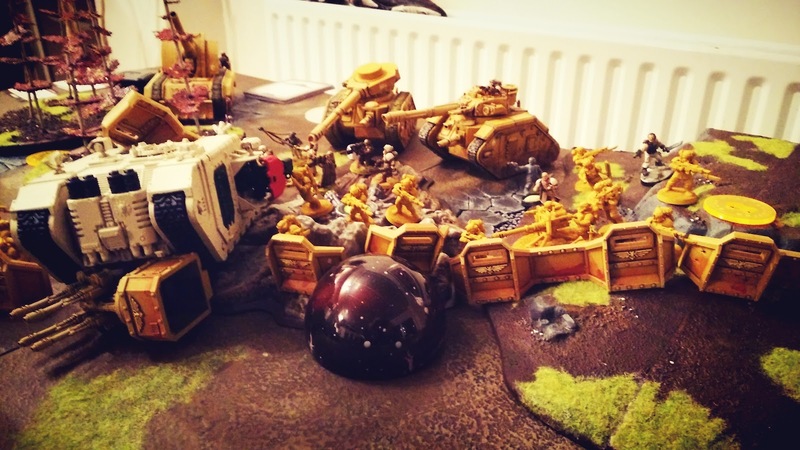 The guard scattered without injury but with the Quad Gun unable to move it was destroyed instantly - CRUNCH! [At least that was my/our interpretation, it's not a vehicle so it isn't rammed either]. Unfortunately, having used up so much speed I couldn't do anything else. 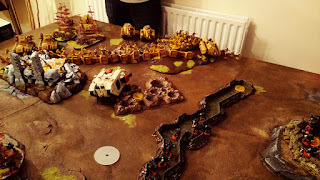 The Assault Cannon was gone, the Flamestorms can't fire and the Terminators can't get out. 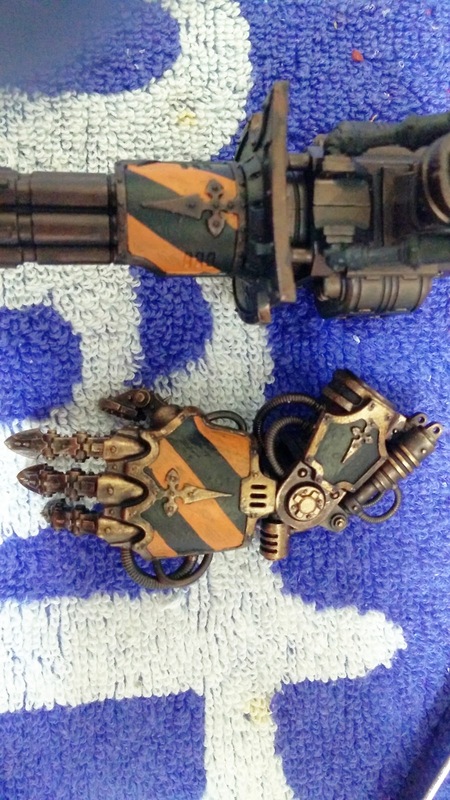 The Techmarine failed to repair the Hull Points. 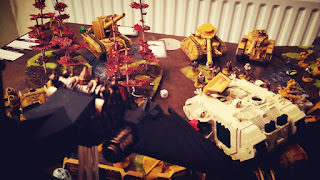 Having avoided the Quad Gun the Dark Talon opened up the Rift Cannon on the Leman Russ Vanquishers. 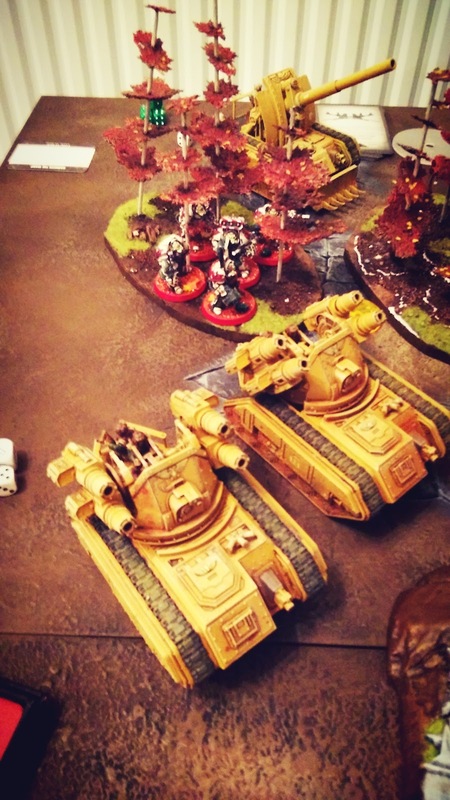 Rolled to scatter, got double two so it hit both tanks. Rolled to pen and got another two 2's, then I remembered the main reason I wanted to use this afterall. Doubles on the scatter get me VORTEX! So the second roll becomes the Destroyer table rolls and I get two D3 hull Points on the Squadron, I get a 5 and 1, destroying the nearest tank. The Dark Talon manages to evade all incoming fire, without even resorting to Jink. 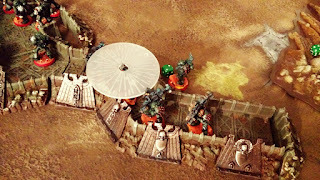 The Basilisk takes aim at the Bastion [because I'd retreated the remains of my Tac Squad into it]. 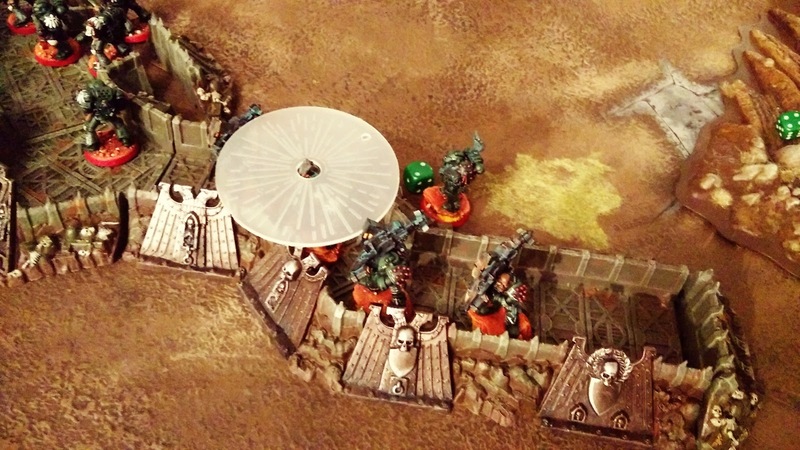 The Bastion collapses, leaving just two marines alive, they bolt and run back 8" before regrouping. 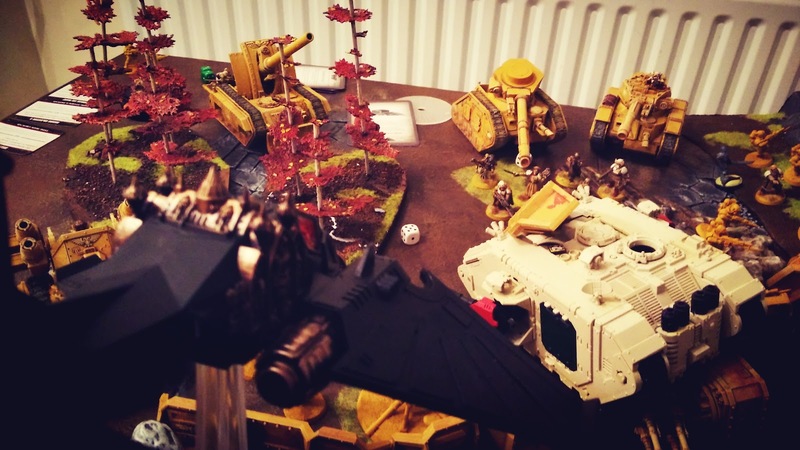 My Turn 3 and the Deathwing arrive, this time safely in the woods deep in enemy territory. I manage to get a couple of Hull Points off a Wyvern. The Vortex continues it's merry way. 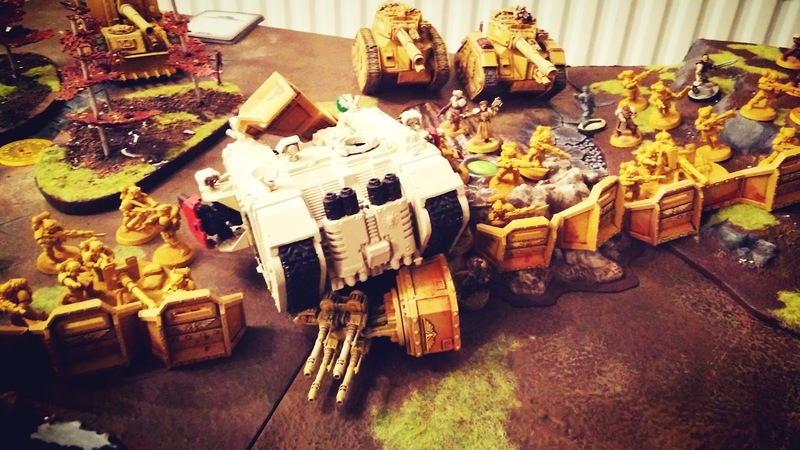 I try to move the Land Raider and it becomes immobilised on the remains fo teh Quad Gun. The Deathwing sally forth with the Librarian. 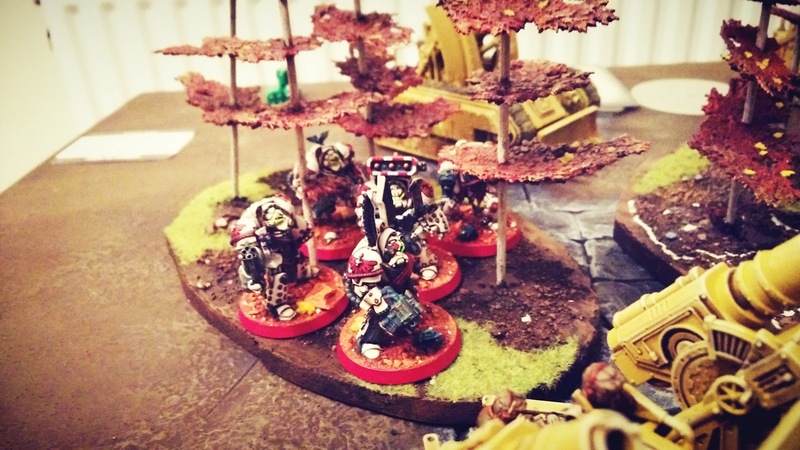 The libby psychically screams at a command unit of five Guardsman killing all of them. The Terminators manage to destroy the Basilisk with a perfect 7" charge and another unit falls allowing me to get D3 VPs, getting 2, plus another one for claiming and objective. 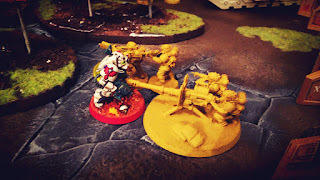 Meanwhile the Librarian gets killed assaulting the other Command squad, overwatch did not help. The Chaos G.O.D.s are a capricious bunch as the Vortex scattered directly on top of the last remaining Vanquisher, but I only rolled a 1 on the Destroyer table meaning the leman Russ was left with a Vortex hat! 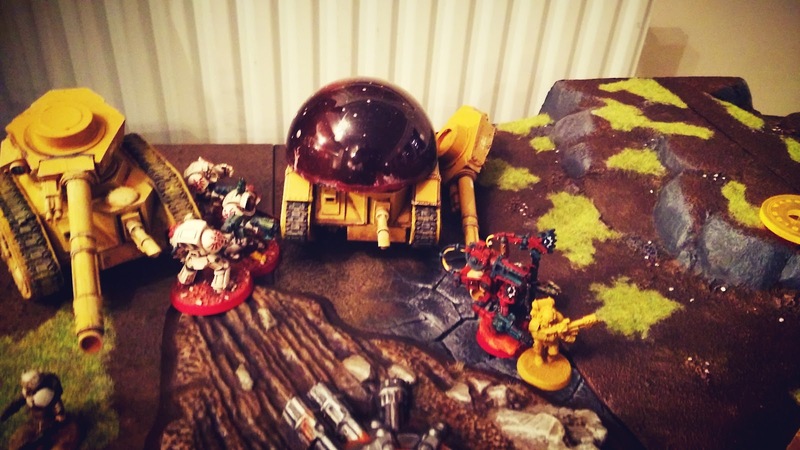 With the Land Raider wrecked by Haywire grenades from the Skitarii the Techmarine abandons it and takes out most of the Heavy Weapons squad. The Terminators scramble over the wrecked Vanquisher to assault the remaining tank only to be overzealous and the resulting pummelling from powerfists blows up two of their own! 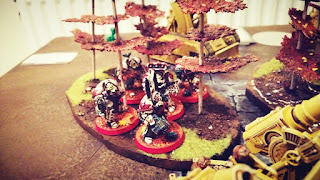 On the other side the last remaining Terminator assaults the second Heavy Weapons squad but nobody does anything. 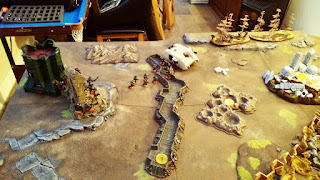 The final score was 14:4 to Ben, his Maelstrom cards were a damn sight more forgiving than my own but even so my army was pretty much outgunned and outmatched. The Dark Talon was pretty cool, but it was pointed out that with a tank killing S10 AP2 Rift Cannon and infantry killing double Hurricane Bolters you're going to struggle to utilise both weapons on the same target, which is unfortunate. 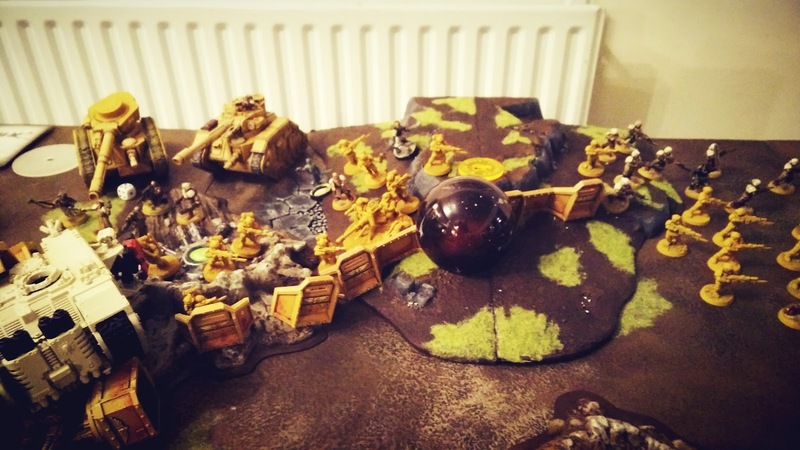 I love the Vortex though and although 160pts is quite expensive I'm sure I'll be taking one just for the lolz. That said the Bastion was an utter waste but I really don't have anything to replace it with points wise and at least it increased it's unbroken record of not surviving a game. 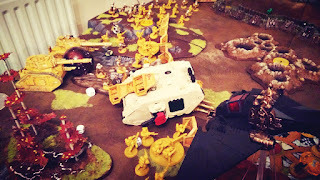 A lot of things failed to perform, but most didn't even get chance to as they were wiped out first turn - Scouts, Devastators. 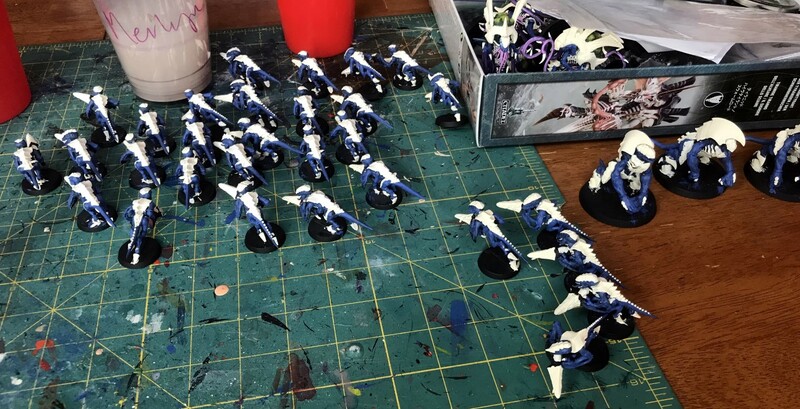 This is still a steep learning curve for me, every marine is valuable, I can't sell them cheap like Termagants and they run away too! It amazes me they're the 'basic' choice for beginners. It's definitely making me look with fresh eyes at the nids and the things that do work but although I was 'crushed in defeat' I did really enjoy trying something different for a change.